Haughton Castle sits on the banks of the North Tyne and is a popular film set location. The castle bears over Barrasford and is an impressive building that is still occupied. Parts of the castle have been modernised. The castle is not open to the public but can be found by taking the A6079 north from Hexham. At the crossroads (4 miles) turn left and at the roundabout take the last exit for Humshaugh. Haughton Castle dates back to at least the 14th century, when it was fortified. It was first called a castle in 1373 when the original tower house was heightened and turrets were added together with parapet walks. At this time the castle was owned by Gerald Widdrington and, although it was still owned by the Widdringtons in the early 14th century, the Swinburns were living in it. By the 16th century the castle seems to have been falling into disrepair and ruin and an attack by Border reivers in 1541 saw nine horses and goods worth £40 stolen from it. No major improvements were carried out until the early 19th century when it was turned into a fashionable country house and parkland was laid out. The early development of the castle shows it was an upper floor hall house with turrets and a parapet added in the 14th century. Haughton Castle is probably one of the earliest 13th century upper floor hall houses in Northumberland and must be one of the best preserved hall houses in the north of England. This is a Grade I Listed Building protected by law. The ghost of Haughton Castle, Archie Armstrong, dates from a time when the Border Reivers would attack English land, quite legally and then return to their tribes in Scotland. Sir John de Widderington, at that time was the Lord of Haughton Castle and known for being a good and gallant person. During Sir John's rule at Haughton Castle, the King appointed the weak-willed Lord Dacre of Gilsland as Lord Warden of the Marches. The warden was to ensure peace across the Border region. Dacre began to accept bribes, ignoring the troubles and causing the law to collapse. He also courted a female of the notorious Armstrong clan, the very sister of the leader of this murdering family troop of reivers. As a result, local landowners formed an alliance to protect their rights and report Dacre's deeds to the King. While Cardinal Wolsley visited York, Sir John de Widderington of Haughton Castle decided to meet with Wolsley. On the night before the meeting, Sir John's men fought and captured a reiver rustling cattle in the local meadows close to Barrasford. The man was incarcerated within the dungeon at Haughton Castle, so he could deal with him when he returned. To reach York by horse in Sir John's days took two days of hard riding on horseback. After arriving at York, Sir John remembered he had the key of the Haughton Castle dungeon in his pockets and that worse still he had left no instructions about care for his prisoner. Sir John turned his horse around and headed back to Haughton Castle, by the time he reached Durham, his horse dropped dead with exhaustion. When he reached Tynedale 2 days later he feared the worse. "How fared the prisoner?" Sir John asked his servants. The servants replied that the man cried and moaned, then he began to scream but the noise died down, and nothing had been heard since. Sir John unlocked the cell in the Haughton Castle dungeon and found the prisoner dead. The spirit of Archie Armstong returned to haunt Haughton Castle months later, night after night the sounds of the prisoner cries and moans would echo around the surrounding countryside as far as the village of Barrasford. The screams would keep awake Sir John and his staff and the local residents through the night. The village of Barrasford demanded that he take action. The Rector of Simonburn was called in to exorcise the ghost; this he did immediately and nothing was heard no more. To comfort Sir John, the Rector left with him the Black-lettered Bible from which he read during the exorcism. Curiously, when the Bible was sent to London for rebinding the reiver's moaning and screams returned to haunt Haughton Castle. Orders were given to return the Bible quickly from London and lay the spirit of the ghost once again. 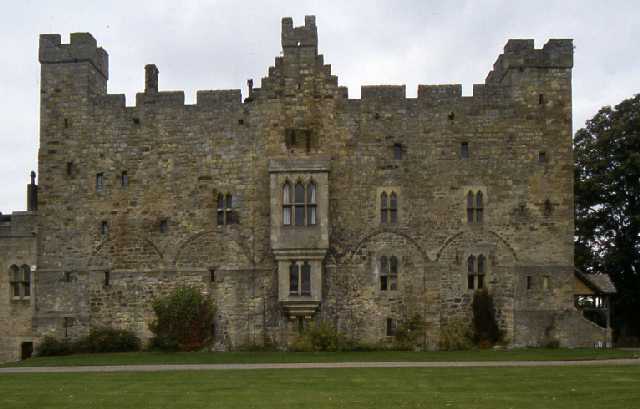 Local legend states that the screams from Haughton Castle can still be heard every evening that a descendant of Sir John de Widderington sets foot inside Haughton Castle in the county of Northumberland. i saw this and wondered what you all think about this one? Thanks for this one . it looks very interesting , this maybe worth looking into as a possible location .